Make yourself at home in one of the 40 air-conditioned rooms featuring kitchenettes with refrigerators and microwaves. Rooms have private balconies or patios. Flat-screen televisions with satellite programming provide entertainment, while complimentary wireless Internet access keeps you connected. Conveniences include phones and safes, and housekeeping is provided daily. Located in Agios Nikolaos, Elounda Water Park Residence Hotel is within the vicinity of Spinalonga and Spinalonga Castle. This 4-star aparthotel is within the vicinity of Plaka Beach and Port of Agios Nikolaos. At Kalypso Hotel, enjoy a satisfying meal at the restaurant. Quench your thirst with your favorite drink at the bar/lounge. Continental breakfasts are available daily for a fee. Located in Agios Nikolaos, Elounda Ilion Hotel Bungalows is by the sea, within a 15-minute drive of Spinalonga and Spinalonga Castle. This 4-star hotel is 27.4 mi (44 km) from Star Beach Water Park and 25.1 mi (40.5 km) from Stalis Beach. Close to the stunning Elounda coast, Elounda Krini Hotel is taking full advantage of its amazing location; a complex of white-washed accommodations, making use of natural materials and local design elements, the hotel blends ideally with the surrounding stunning landscapes.Just 200 m from Elounda Beach in Crete, Elounda Krini Hotel features free WiFi, a restaurant and buffet breakfast. Rooms have a balcony overlooking the Cretan Sea and Spinalonga Island, or the mountains and pool.The air-conditioned rooms at Elounda Krini feature a satellite TV. All rooms have access to the hotel gardens. Each provides a private bathroom with shower. A free fridge is included.Lunch and dinner are served at the restaurant and include local and international dishes. Guests can have drinks, coffee and snacks at the pool bar in the garden. The scenic town of Agios Nikolaos is 9 km away. Free private parking is possible at the hotel. Elounda Garden Suites is 100 m from Elounda centre and 2 minutes walk from the beach. Featuring soft tones and modern style furnishings, all air-conditioned units at Elounda Garden include a seating area with a flat-screen TV and iPod/iPhone dock. A kitchenette with coffee maker and a dining table are also provided. The private bathroom is stocked with free toiletries, slippers and hairdryer.Boasting an outdoor pool, Elounda Garden Suites offers tastefully decorated accommodation opening to a furnished balcony with mountain views.A sandy beach can be found 150 m away.Guests can enjoy a meal at the on-site restaurant, or have a refreshing drink and light meal from the snack bar. More dining options can be found 100 m away. Mini markets lie within 100 m as well. Located in Agios Nikolaos, Elounda Breeze Resort - All Inclusive is by the sea, within a 15-minute drive of Spinalonga and Spinalonga Castle. This 4-star property is 27.3 mi (43.9 km) from Star Beach Water Park and 25 mi (40.3 km) from Stalis Beach. Located in Agios Nikolaos, Elounda Palm Hotel is by the sea, within a 10-minute drive of Spinalonga and Spinalonga Castle. This family-friendly hotel is 27.8 mi (44.7 km) from Star Beach Water Park and 25.5 mi (41.1 km) from Stalis Beach. Enjoy Greek cuisine at Thalassa, a beachfront restaurant where you can enjoy drinks at the bar, take in the ocean view, and even dine alfresco. Quench your thirst with your favorite drink at the beach bar. Picturesque Elounda, on the north-east coast of the Greek island of Crete, was once known simply as a pretty little fishing village. As its reputation grew so did the number of visitors, transforming Elounda into a resort famous for its scenery. 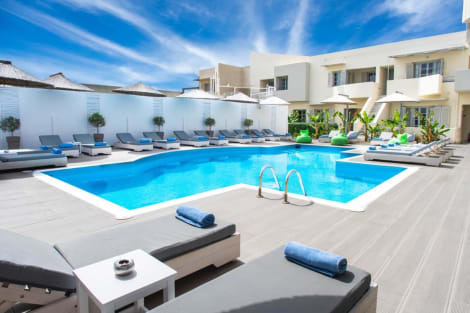 Book an Elounda hotel with us and discover why the town is such a popular attraction. Visitors come to Elounda to escape the cut and thrust of daily life and unwind. This is easy to do on one of the golden-sanded beaches with the azure sea gently lapping at your toes. The main beach in Elounda is adjacent to the harbour and comes with a host of sunloungers and a lifeguard. All around you'll find a range of convenient of cafés and restaurants. The further away from the centre of Elounda you go, the more sparsely populated, but no less inviting, the beaches become. For the more adventurous traveller, there are a variety of activities available. The Blue Dolphin Diving Centre is your gateway to over 20 dive sites created by a team of enthusiasts working in tandem with marine biologists. Diving in Elounda is a thrilling and fun way to experience the warm, Cretan waters and discover the proliferation of sea creatures that live beneath the waves. You could rent a 4x4 and head inland through sweeping landscapes populated by green olive trees and experience the simple charm and hospitality of local villages. There are plenty of places to eat and drink in Elounda and all tastes are catered for. Haroupo Ergospasio is renowned for its fresh fish and seafood, and fine wines as a perfect accompaniment. This tastefully rustic restaurant has a balcony from which you'll observe splendid views across the bay. Established in 1968, Eden Bar Café, close to the port, is a lively hostelry that welcomes children, and serves breakfast, lunch and dinner. For a change of scenery, visit the island of Spinalonga, a 5km drive from Elounda, followed by a short boat trip to the island itself. This one-time Venetian fortress isle has long been popular with TV and filmmakers. In the 1970s, Spinalonga was the location for the popular BBC series, 'Who Pays the Ferryman'.